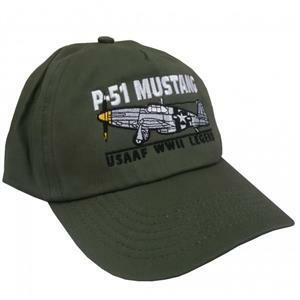 This high quality canvas-feel cap is miltary olive green and features a side view of the iconic North American P-51 Mustang fighter and the words "P-51 Mustang - USAAF WWII Legend" embroidered on the front. The caps are 100% cotton and fully adjustable via a rear velcro strap. The perfect accompaniment to one of our aviation blueprint t-shirts!